Sonos app update tweaks design for faster playback | What Hi-Fi? The Sonos app is getting a redesign in an effort to simplify queueing and playing music. 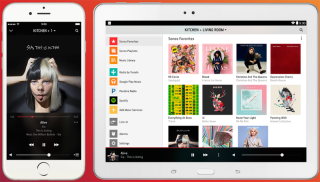 Sonos has released a new public beta for its Android app, with the intention of making it easier for users to control and play music. The app has been redesigned so that the 'Play All' and 'Shuffle' buttons now appear at the top of the Album and Playlist screens, which should give users much faster access. You can now also instantly start a song in the Sonos mobile app by tapping it, rather than having to use the 'Play Now' or 'Play Next' functions; similarly, on a Mac or PC, you can now just double click on a song to play it. The way the Sonos app queues music has also been reworked. Previously you had to tap the song title in order to view your listening options - now you can touch the three dots that appear on the right, which open up more options such as 'Play now', ‘Play next,’ or ‘Add to end of queue’. Songs can also now be started from an album, playlist, or the queue and, once finished, Sonos will immediately play whatever has been lined-up next in the tracklist. Sonos has also attempted to make sending music from one room to another much simpler. To join the Sonos Public Beta Programme, make sure that your device and the Sonos system are both on the same WiFi network. Open the Sonos app from your Android device, open your 'Settings' and go to 'Advanced Settings'. After that, tap the 'Beta Program' option, and then 'Join the Beta Program'. You can read more about it on the Sonos website. The Sonos app update should be available now.